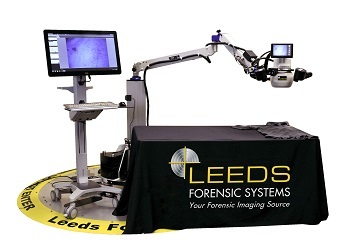 Introducing the next generation digital ALS system, the LSV2 Leeds Spectral Vision System. The LSV2 is a multi-wavelength imaging tool used to view, capture, and document bodily fluids, victim bruising and bite marks, trace evidence, accelerants, explosives, and gunshot residue on various types of samples. Sensitivity - highly sensitive camera offers sensitivity equal to and greater than the human eye in fluorescence and infrared. Ease of use - High throughput screening and documentation without requiring advanced photographic experience? Highly variable field of view and working distance - Enormous versatility in screening and documentation of wide varieties of evidence. With its freely rotating gimble system, containing over 59" of horizontal reach and 46" of vertical height adjustment, the LSV2 has a massive reach and spread allowing it to effortlessly cover evidence tables.